If you're looking to transfer a balance from a high-APR card and enjoy a lengthy 0 percent APR period, Chase Slate®Chase Slate® could be the card for you. Why? Chase Slate®Chase Slate® waives balance transfer fees for 60 days when you open an account. It also offers 0 percent APR for 15 months on both balance transfers and purchases. Paying no APR or balance transfer fees initially means transferring a balance could save you a substantial amount of money if you're needing a few extra months to pay it off. Imagine how much more quickly you could pay down your debt if every penny you pay on your bill each month goes to the principal rather than the interest. You only have 60 days without a balance transfer fee, though, so you'll want to make the transfer quickly. The balance transfer fee is 5 percent of the amount transferred with a minimum of $5 after that introductory period. Save with a $0 intro fee on transfers made within 60 days of account opening, plus 0 percent APR on purchases and balance transfers for 15 months. If you happen to miss a payment, you won't see a penalty APR kick in. This card is our 2018 Best Balance Transfer Credit Card Editor's Choice pick. This card's 0 percent intro APR on balance transfers for 15 months is not as long as the 21 months or 18 months offered by a few other card options discussed in the review below; however, those cards charge a balance transfer fee while Slate® charges no fee on transfers made within 60 days of account opening. What sets Chase Slate®Chase Slate® apart from other balance transfer cards is that it doesn't charge a balance transfer fee initially. Other cards may offer longer introductory periods with no APR, but they may also whack you with a 5 percent balance transfer fee from the start. That's not the case with this card. A balance transfer fee can really add up. Let's say you want to transfer a $10,000 balance. If you have a 5 percent balance transfer fee, you would have to pay a $500 transfer fee. Right there Chase Slate®Chase Slate® saves you a chunk of change and that's before you even consider the months to pay off that $10,000 without accruing interest. Besides the balance transfer benefits, Chase Slate® waives any APR for the first 15 months on purchases, too. So, you can purchase a big-ticket item, pay it off within that intro time frame and not pay a penny in interest. Chase Slate®Chase Slate® doesn't charge an annual fee or implement a penalty rate if you miss payments either. You are still charged a late fee (as much as $37), and late payments are reported to the credit bureaus so it's still wise to make all your payments on time. You don't want your credit score to suffer. Speaking of credit scores, Chase Slate®Chase Slate® helps you keep tabs on your score. You get a monthly personalized credit dashboard that provides your FICO® score and tips on how to improve your score and manage your credit. The card additionally protects you with zero liability fraud protection and activity alerts if there are potentially suspicious purchases. Chase Slate®Chase Slate® also offers the benefits of other Chase cards, including auto rental collision damage waiver and extended warranty protection. Though Chase Slate®Chase Slate® is an excellent balance transfer card, you can't transfer balances from another Chase account to Chase Slate®, which isn't unusual – most banks won't allow transfers like that – but it's also something to keep in mind. There is no rewards program associated with Chase Slate®Chase Slate®. 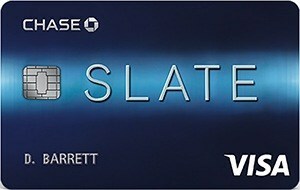 There are other cards out there that offer you a balance transfer zero-interest period along with the opportunity to earn cash back or miles for travel, but Chase Slate®Chase Slate® is geared specifically toward consumers who want to transfer balances and don't want to pay an annual fee or deal with a rewards programs. There is a 3 percent foreign transaction fee, so this card isn't ideal for international travelers. Though Chase Slate®Chase Slate® does offer some perks like extended warranty protection, the card doesn't provide as many perks as others, such as travel cancellation insurance or special promotions for hotels and airlines. Chase Freedom® offers the same 15-month introductory period with 0 percent APR on purchases and balance transfers (then, 17.24 - 25.99% Variable) and no annual fee; however, on all balance transfers, Chase Freedom® charges either $5 or 3% of the amount of each transfer, whichever is greater. On the other hand, Chase Freedom® has a rewards program. Chase Freedom® lets cardholders earn 5 percent cash back on up to $1,500 in combined purchases in rotating bonus categories each quarter when you activate. So, you may get 5 percent cash back at gas stations one quarter, while the next one could be restaurants. For all other purchases on Chase Freedom®, and on purchases over the spending cap, you get 1 percent cash back. Chase Freedom® also gives you a $150 bonus when you spend $500 in the first three months. The Citi Simplicity® Card - No Late Fees Ever provides a longer 0 percent APR introductory period than Chase Slate® (Citi is a CardRatings advertiser). While Chase Slate® gives 15 months, the Citi Simplicity® Card - No Late Fees Ever offers 21 months on balance transfers from date of first transfer, all transfers must be completed in the first 4 months (then, 16.24% - 26.24%* variable, based on creditworthiness). One difference though is the Citi Simplicity® Card - No Late Fees Ever charges a $5 or 5 percent balance transfer fee, whichever is more. If you transfer a balance with this offer after your 0 percent intro purchase APR expires, both new purchases and unpaid purchase balances will automatically acrrue interest until all balances, including your transferred balance are paid in full. Neither card charges an annual fee or a penalty rate if you miss payments, but the Citi Simplicity® Card - No Late Fees Ever goes a step further by not charging a late fee. Now, that might sound like a great perk, but remember that those late payments still show up on your credit report. Missing a payment also doesn't help you bring down your balance. So, be careful taking advantage of this perk. The HSBC Gold Mastercard® credit card charges an intro 0 percent APR for the first 15 months on both purchases and balance transfers (then, 14.24%, 20.24% or 25.24% Variable), but it does charge $10 or 4 percent, whichever is greater, as a balance transfer fee. So, the HSBC Gold Mastercard® credit card provides an equal time with no APR, but there is a fee, which you don't get with Chase Slate® for 60 days. Neither card charges an annual fee, and the HSBC Gold Mastercard® credit card won't charge you a penalty rate if you miss payments (just like Chase Slate®). Neither card has a rewards program, but the HSBC Gold Mastercard® credit card doesn't charge a foreign transaction fee, which makes it a potentially better option for international travelers. Who Should Get Chase Slate®? Chase Slate®Chase Slate® is best for consumers who want to transfer a balance from a high-APR card and pay down their debt during the no APR introductory period. Beyond paying down your debt, Chase Slate®Chase Slate® is an excellent card if you don't care about the bells and whistles of a credit card rewards program, but want a solid credit card without an annual fee. I made the mistake of being drawn in by the transfer balance. I have since paid off my balance and do not wish to give them any more of my business. When making an electronic payment, it takes them 5-7 days to process this payment. During this time if you set the payment to execute on the due date, they assess a late fee because the payment has not gone through on the electronic side. This is the only card that does this. Need less to say they accrue most of their money from those dishonest and ill-gotten methods. In actuality the due date is not the real due date, it is 5-7 days before the due date. If this review saves one person from making the same mistake it was worth it.